1Department of Radiation Oncology, All India Institute of Medical Sciences, Ansari Nagar, New Delhi, India-110029. 2Department of Radiology, All India Institute of Medical Sciences, Ansari Nagar, New Delhi, India-110029. 3Department of Pathology, All India Institute of Medical Sciences, Ansari Nagar, New Delhi, India-110029. *Address correspondence and reprints request to: Manisha Jana, Department of Radiology, All India Institute of Medical Sciences, Ansari Nagar, New Delhi, India-110029. Mondal D, JAna M, Julka PK, Arava SK. An Uncommon Cause of Headache. Oman Med J 2013 Sept; 28(5):371-372. A 45 year old male presented with chronic headache for the last six months, with recent aggravation. The headache was holocranial in nature and not associated with vomiting, aura or any other neurological complaints. On examination, he had no neurological deficit. 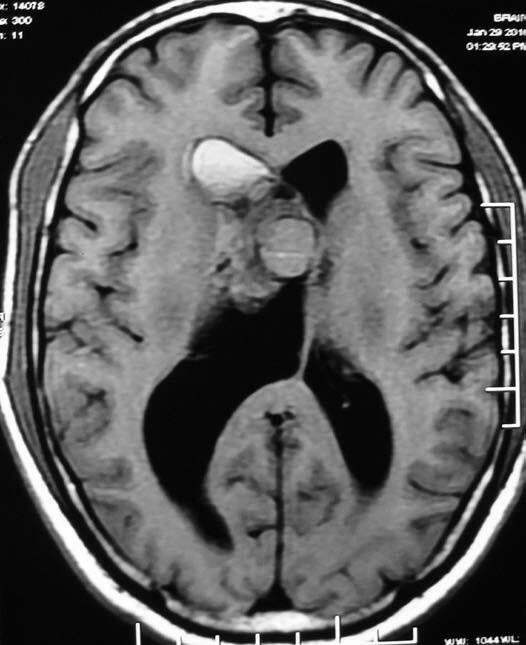 Contrast enhanced Magnetic Resonance Imaging (MRI), was performed which revealed features suggestive of intraventricular neurocytoma with intraventricular hemorrhage (Figs. 1-3). He underwent gross total excision of tumor after frontal craniotomy and through anterior transcallosal approach. 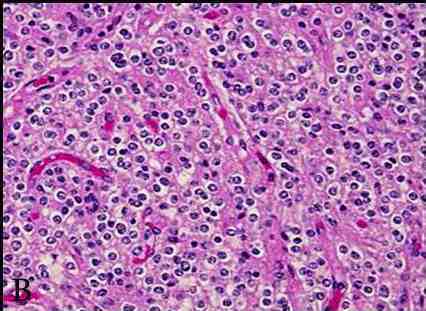 Histopathology suggested a diagnosis of neurocytoma WHO grade II. Figure 1a: Axial T1 weighted image of the brain revealed a mass lesion in right lateral ventricle with heterogeneous signal intensity and hyperintensity in the frontal horn of right lateral ventricle suggesting intraventricular hemorrhage. Figure 1b: Axial T2 weighted MR image reveals heterogeneous hyperintense signal intensity of the mass lesion. 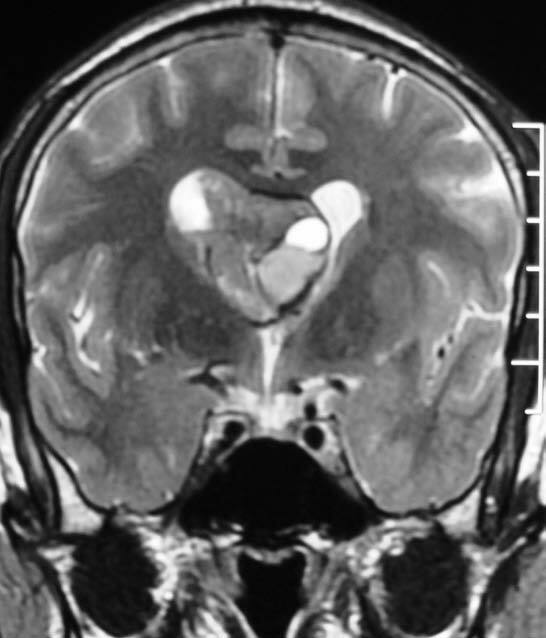 Figure 2: Coronal T2 Weighted MR image reveals the mass lesion to be located in the frontal horn of right lateral ventricle and typical contralateral displacement of the septum pellucidum. 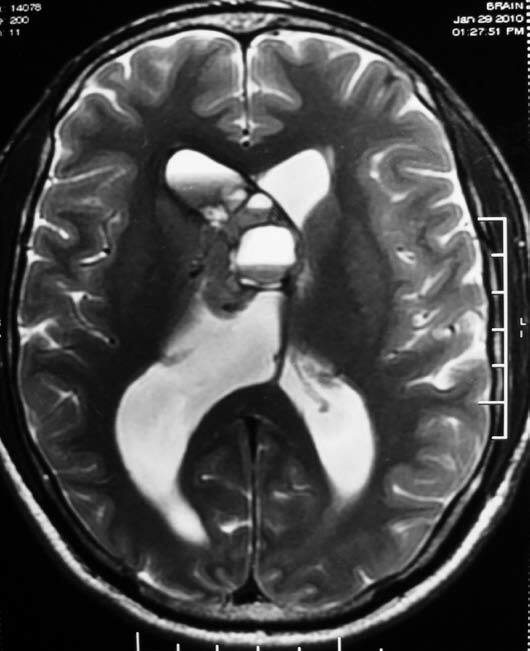 Figure 3: Axial T1 weighted contrast enhanced MR image of the brain revealed heterogeneous enhancement of the mass lesion. 1. What is the imaging diagnosis? 2. What are the differential diagnoses? 1. Imaging diagnosis points towards central neurocytoma. Figure 4: Photomicrography of central neurocytoma. (a) Tumor shows numerous round nuclei with finely speckled nuclear chromatin arranged in a diffuse pattern. These cells have indistinct cell borders with fibrillary and vascularized matrix (H&E, ×10). (b) On higher magnification neoplastic cells with perinuclear halo are seen focally, resembling oligodendroglia like appearance. 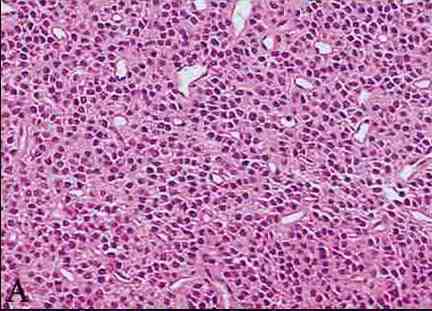 There is minimal nuclear pleomorphism and mitosis with endocrine like vascularization. (H&E, ×20). Hassoun et al. 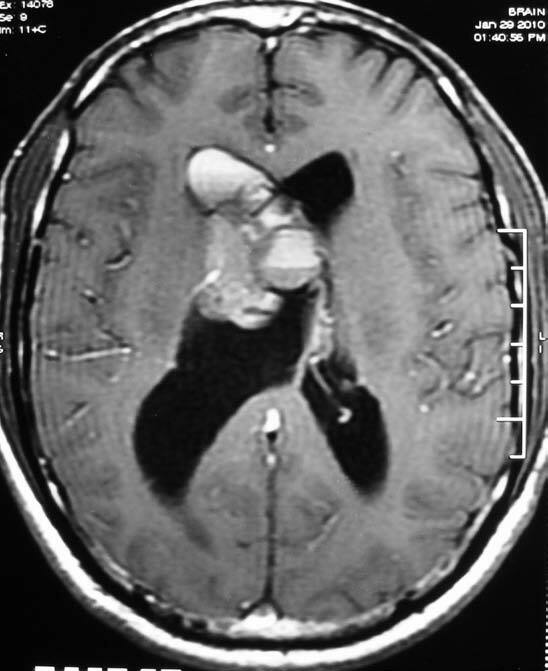 first coined the term ‘intraventricular neurocytoma’ to describe a benign primary brain tumor usually affecting young adults and most commonly seen in the lateral and the third ventricles.1 Various other nomenclatures including differentiated neuroblastoma and intraventricular neuroblastoma have been used to describe this entity. They are very rare central nervous system (CNS) tumors of neuronal origin. In adults, it represents almost half of supratentorial intraventricular tumors, but overall, it constitutes less than 1% of all CNS tumors.2 Misdiagnosis of this lesion on histopathology as oligodendroglioma and on imaging as meningioma, ependymoma, oligodendroglioma, choroid plexus papilloma have been reported. 1. Hassoun J, Gambarelli D, Grisoli F, Pellet W, Salamon G, Pellissier JF, et al. Central neurocytoma. An electron-microscopic study of two cases. Acta Neuropathol 1982;56(2):151-156. 2. Hassoun J, Söylemezoglu F, Gambarelli D, Figarella-Branger D, von Ammon K, Kleihues P. Central neurocytoma: a synopsis of clinical and histological features. Brain Pathol 1993 Jul;3(3):297-306. 3. Zhang D, Wen L, Henning TD, Feng X-Y, Zhang Y-L, Zou L-G, et al. Central neurocytoma: clinical, pathological and neuroradiological findings. Clin Radiol 2006 Apr;61(4):348-357. 4. Yeh IB, Xu M, Ng WH, Ye J, Yang D, Lim CC. Central neurocytoma: typical magnetic resonance spectroscopy findings and atypical ventricular dissemination. Magn Reson Imaging 2008 Jan;26(1):59-64. 5. Chen C-L, Shen C-C, Wang J, Lu C-H, Lee H-T. Central neurocytoma: a clinical, radiological and pathological study of nine cases. Clin Neurol Neurosurg 2008 Feb;110(2):129-136. 6. Leenstra JL, Rodriguez FJ, Frechette CM, Giannini C, Stafford SL, Pollock BE, et al. Central neurocytoma: management recommendations based on a 35-year experience. Int J Radiat Oncol Biol Phys 2007 Mar;67(4):1145-1154.